I’ve been faithfully knitting along on my 100-mile skirt until yesterday, when between Scott Road and Gateway Skytrain station, I ran out of yarn. I’ve done 6 pattern repeats and have just increased in the purl ditches. In my other knitted skirt, I ended up with 14 pattern repeats, and I imagine I want the same length. 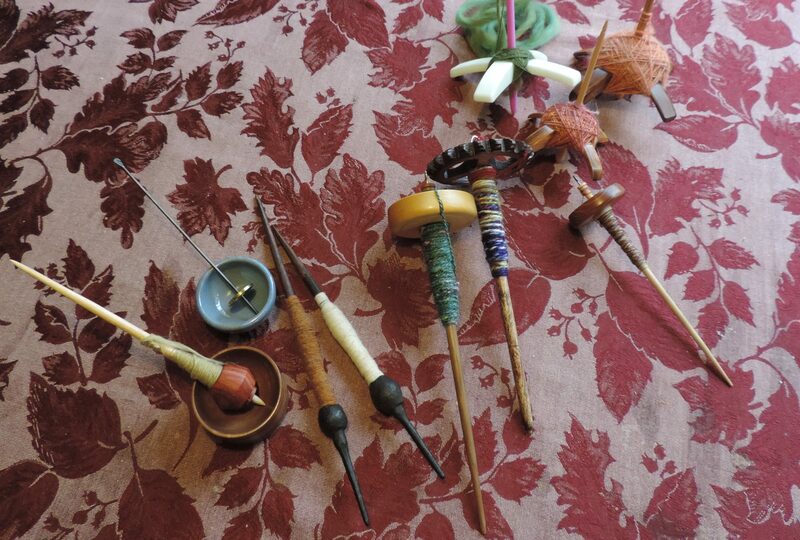 But that’s all the knitting for now. 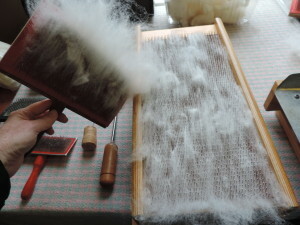 I have to go back to the very beginning and comb some more of that nasty alpaca and do a whole bunch more spinning. I figure I am slightly less than 2/3rds of the way through. 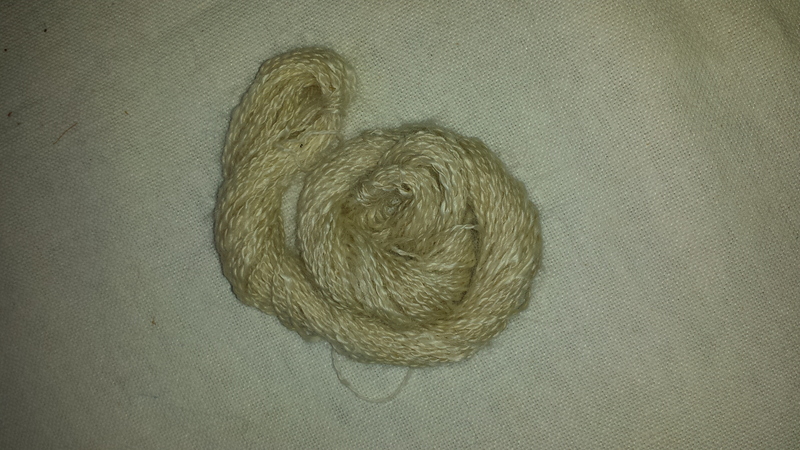 But it does get wider as it gets longer, so I may actually need almost as much as I started with. Wow, that just knocked me back — that took a long time to make. Not that I mind the combing or the spinning. It’s easy and mostly fun. It’s just that I was really enjoying the knitting. I was at the stage of knitting the pattern where I had it memorized — believe me it’s not a difficult pattern, but I have it all in my head. If I take too long a break, I’ll loose my rhythm with it. Which is why I am being boringly disciplined with myself and am spending the day combing the alpaca — here’s a close up of it. You can see all the vegetation and nasty bramples just waiting to stab me as I reach in for a lock. To cheer myself up, I’ll move my lovely bouquet (thanks Davy) into my newly tidied studio to keep me company. Flowers, Bizet’s Carmen on Radio 2 and maybe a wee glass of bubbly. 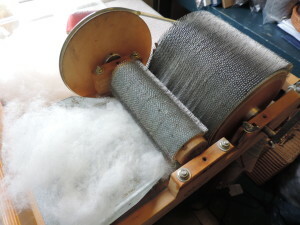 This entry was posted in 100-mile clothing, alpaca, knitting on February 23, 2013 by DianaTwiss. A while back two of my darling neighbours, young lads named Adam and Ian, came to the house and gave me a huge bag of cria alpaca. [Cria is what a baby alpaca is called.] 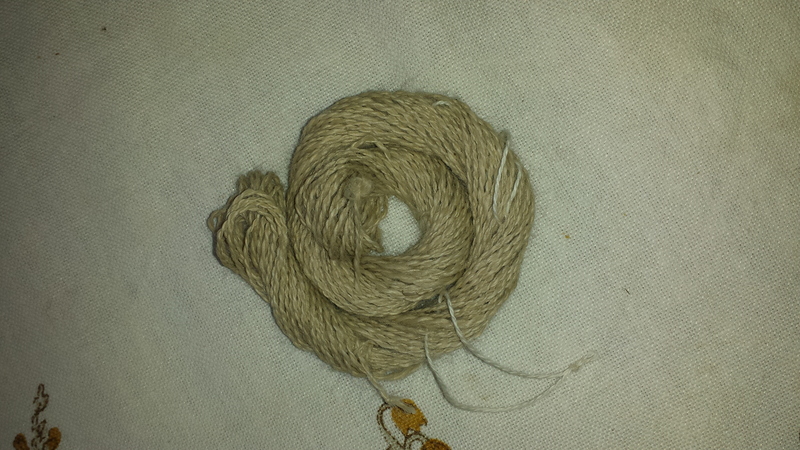 This fibre came from an animal named Sasha — the pet of a friend of theirs. Sasha’s “hair” was getting mighty long so her owners had her shorn. 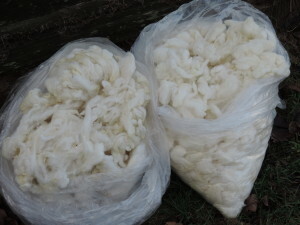 They were going to toss all the wonderful fibre all onto the compost as they didn’t know that anything useful could be done with it, but fortunately Adam and Ian were on their game and intervened. 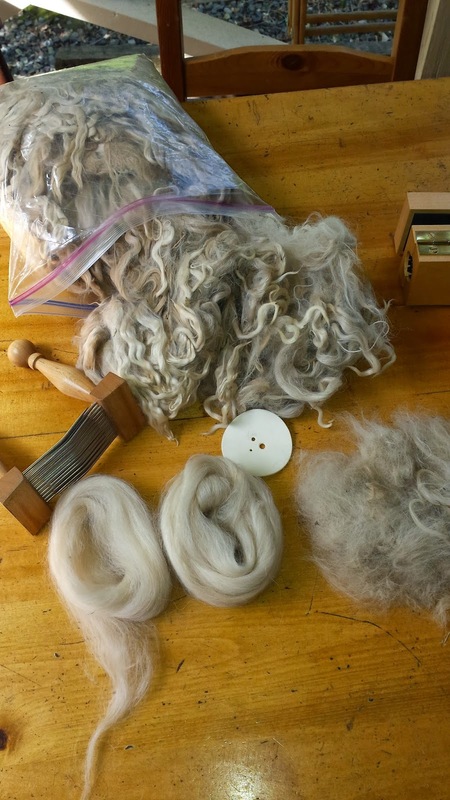 They know things about making yarn and the mysteries of fibre. 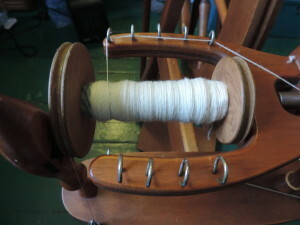 Their grandmother and I are both spinners so these young lads are well schooled in what is possible for the fibre arts. They talked their friend into giving them the bag of newly cut alpaca for they had a plan. They came to my house, gave it to me, and it exchange for hugs and much appreciation, they walked away with jars of strawberry and raspberry jam. These boys have good instincts. The fibre is lovely, soft and mostly clean. And it’s white! Which means that there are so many dyeing options. 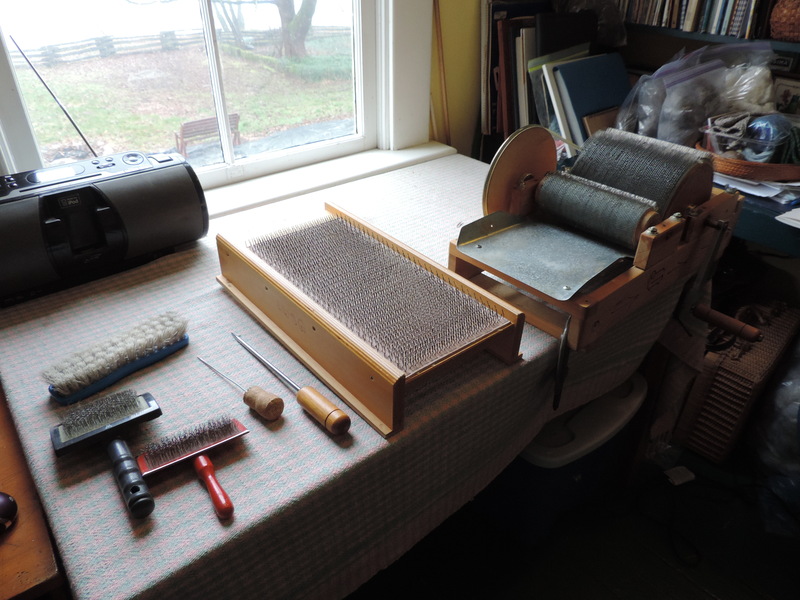 Here it is all laid out on a table for sorting. Because it is a pet it has been well fed and seems to have lived stress-free. 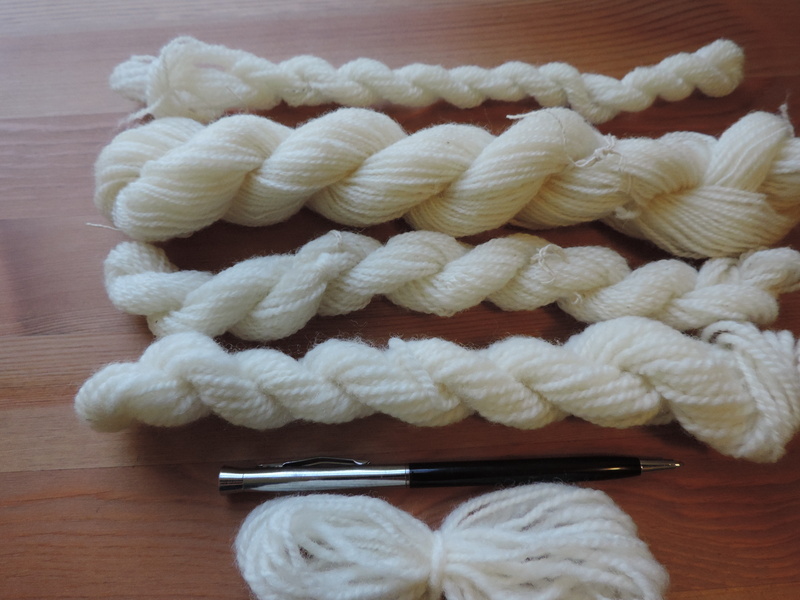 Here is a small sample combed and spun lace-weight. It is divine. I can’t wait till I have the time to dive into this an make something substantial from it. Here is a mini-skein of it spun up on my lace-weight spindle. It’s wonderful stuff. Sometimes pennies fall from the skies, and sometimes they walk across the road. This entry was posted in alpaca, handspun yarn, spinning on October 7, 2012 by DianaTwiss.